Some students will be assigned with same number (of course, one number, remember?). Teacher will ask one of them to answer questions. During this process, other guys can pick up the call to join their discussion. In MSS, the user who want to join call can dial “*74” to do that by default. When developing this feature, we think about previous “virtual conference room” feature. We believe this feature is too complex to use and few people like it, so we decide to cut it from V22 and abover versions. In future, we will plan to develop a new three parties conference service. V21 is released today to support a new service: one number, multi-devices. This service can enable MSS to accept several SIP phones with same local user’s number and authorization. And for incoming calls, all these phones will be ringing at the same time. “One number” service looks like “ring group” feature. 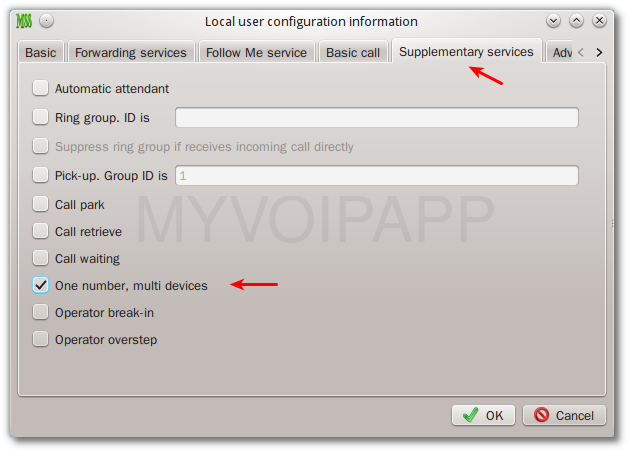 The difference is that “one number” service permits several SIP phones to share same local user profile, but “ring group” service requires SIP phones configured with different user profiles. By the way, Cloud-MSS has been upgraded to support this feature too.